This highly useful reference outlines best practices in key areas of human resources that are not only fair and equitable, but that can withstand legal scrutiny. Industrial/organizational experts apply their empirical knowledge and practical experience to aspects of HR that are commonly litigated, including broad and specific topics in testing of potential employees, disability issues, compensation and pay equity, and work hours. The book is written to be accessible to readers currently in HR-related graduate-level training as well as HR practitioners with or without background in industrial/organizational psychology. 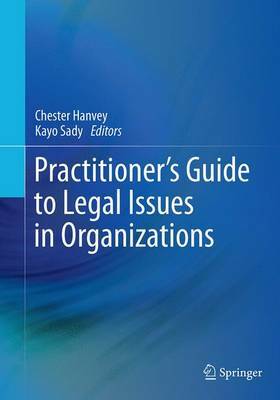 And to add to its utility, chapters feature practical strategies for addressing each of the legal issues presented. Measuring adverse impact in employee selection decisions.Using background checks in the employee selection process.Disabilities: best practices for vulnerabilities associated with the ADA.Physical abilities testing.Wage and hour litigation.Clinical psychological testing for employee selection.Conducting compensation equity analyses. Practitioner's Guide to Legal Issues in Organizations brings clear, up-to-date information to graduate students studying human resources, management, industrial/organizational psychology who are interested in legal issues, as well as applied HR practitioners such as industrial/organizational psychologists, human resources generalists, management and labor economists.